Pressure Tech - Quality Pressure Regulator Manufacturers - HAPPY 50TH BIRTHDAY ROB! 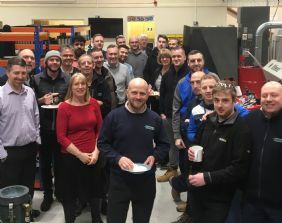 Today we celebrated the 50th birthday of Rob Kelly, one of our valuable members of the team who's been working in our CNC machine shop for close to 3 years. Rob is a keen runner, regularly running 40 miles at the weekend and training for a 112 mile challenge over 24 hours in the Peak District later this year! We're all hoping his joints haven't worn out by the time he reaches 60!